Situated in western Africa, the Fon kingdom of Dahomey (or Abomey in its earliest years) was formed by a mixture of various local ethnic groups on the Abomey plain. The tribal groups, possibly forced to move due to the slave trade, coalesced around a highly centralised, strict military culture which was aimed at securing and eventually expanding the borders of the small kingdom. It also practised human sacrifice in large numbers and traded captives to the slave traders who prospered along its coastline, which was part of the notorious Slave Coast. The kingdom covered the southern third of the modern republic of Benin, and it bore its name until 1975, when it was neutrally renamed the republic of Benin to appease the large number of ethnic groups which formed part of the relatively new state. Dahomey bore no relation to the Benin empire. It was the kingdom of the Fon people, one of the groups which formed the modern Benin state. A group of Aja from the coastal kingdom of Allada had previously moved northwards to settle amongst the Fon people of the interior, and by this date they have gained dominance and declare a kingdom. Declared the founding of the kingdom. m Hanebe, who apparently co-ruled. The Akwamu cross the River Volta to occupy Whydah, a coastal state which is normally subservient to Dahomey (now in southern Benin). This and the Asante clan states are both expanding their territory in this period, often to the detriment of neighbouring kingdoms. Despite conquering his ancestral homeland in Allada, the king is unable to defeat the neighbouring kingdom of Oyo, and Dahomey becomes tributary to it, although in all other respects it retains its independence. The British presence along the West African coast is formalised with the creation of the Gold Coast crown colony. This not only helps to keep the competing French and their Ivory Coast territory from expanding eastwards, but also gives Britain a foothold in influencing the affairs of the Asante kingdom. Only grass and bush separate the French West Africa territories to the north from Asante, and the kingdom of Dahomey borders Asante to the east so the French focus their attentions here instead. Dahomey increasingly loses its status as the regional power. The French begin take control of the territory during the Dahomey War using mainly African troops, quite possibly from neighbouring tribes only too happy to end the kingdom's dominance of the region. Dahomey is incorporated along with many other West African states into France's West Africa colony. Civilian governorship of French Sudan is temporarily ended when the entire colony is reorganised so that eleven of the southern districts are parcelled out to various French coastal territories, including Dahomey, French Guinea, and Ivory Coast. The remainder is split into two administrative regions - Middle Niger and Upper Senegal - which are subservient to the authority of other French colonies. French governor. Also in Somaliland, West Africa, & Madagascar. French governor. Also in Somaliland, & Madagascar. The state is granted autonomy as the republic of Dahomey, followed by full independence two years later. A period of instability follows, with Marxism-Leninism being adopted as the official ideology. The modern republic of Benin is a west African state with its capital at Porto-Novo (originally developed as a port for the slave trade). The government, however, sits in Cotonou, the country's economic centre. Benin is bordered by Togo to the west, Burkina Faso to the north-west, Niger to the north-east, and Nigeria to the east. To the south is the Gulf of Guinea and the Atlantic Ocean, and the majority of the country's population live close to the coast. Benin's shore includes what used to be known as the Slave Coast, the departure point for captives to be shipped across the Atlantic. 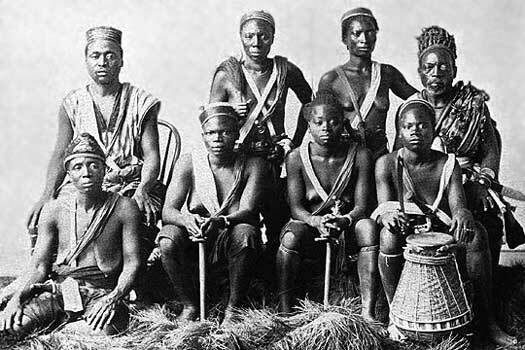 The tribal kingdom of Dahomey in West Africa was ended by French colonial occupation in 1894, after they took control during the Dahomey War of 1892-1894. The state was granted autonomy as the Republic of Dahomey in 1958, followed by full independence in 1960. A period of instability followed, mostly consisting of governmental musical chairs with various coups taking place and presidents being appointed by the military. Along the way Marxism-Leninism was adopted as the official ideology, but economic crisis at the end of the 1980s forced this experiment to be abandoned in favour of parliamentary democracy. Today this country of almost eleven million people is one of Africa's most stable democracies. Despite that, it is also severely under-developed and corruption is rife. 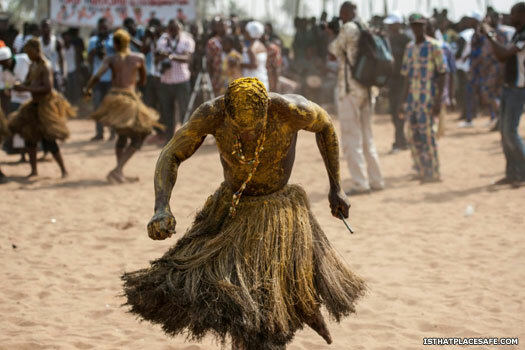 Elements of voodoo, which are still practised in countries such as Haiti, originated from the west African coast which includes Benin. The religion is celebrated on the country's annual Voodoo Day (there are various spellings of 'vodoo', with the original word ending with an 'n', as Voudun or Vodun - Vodoo is a close relative of Nigerian 'Ifa', sharing most of the same minor deities with Ifa under similar or different names, and also using the exact same system of divination). To the north, there have been sporadic clashes along Benin's border with Burkina Faso. The trouble has been blamed on land disputes between rival communities on either side of the border. The country continued to bear its old name until 1975, when it was neutrally renamed the Republic of Benin to appease the large number of ethnic groups which formed part of the relatively new modern state. The name came from the Bight of Benin, which itself gained its name from the Benin empire. Dahomey gains independence and is admitted to the United Nations. Later in the year, elections are won by the Parti Dahomeen de L'Unite. Party leader Hubert Maga becomes country's first president (and escapes an assassination attempt against him in the following year). President Maga is deposed by a coup that is led by the army's chief of staff, Colonel Christophe Soglo. The reason for the coup is stated as being the prevention of civil war between the new state's increasingly antagonistic opposing elements. The focus of recent rioting has turned towards Maga, meaning that Soglo feels justified in removing him from office. Seized power in a coup. Allowed elections in 1964. Soglo has established a provisional government with himself as chairman. 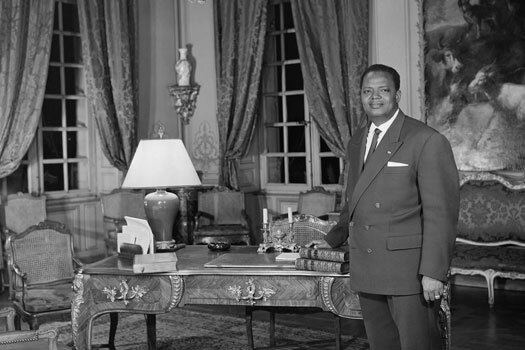 With the government reformed, Sourou-Migan Apithy is elected president in 1964, only to become locked in intense feuding over government policies. Soglo's advice to all parties to engage in productive discourse fall on deaf ears so, in November 1965, he forces the president to step down and a fresh provisional government is formed. In December of the same year Soglo assumes power. Seized power in a coup. Overthrown and retired from politics. Major Maurice Kouandété, one of a group of young army officers, leads a coup against Soglo. Two days later Kouandété is forced to hand power to Lt Col Alphonse Alley who assumes the position of head of state. Appointed head of state following a coup. Force to retire. With Alley sidelined by Lt Col (formerly major) Kouandété, the military regime nominates Dr Emile-Derlin Zinsou as president but in the following year he too is deposed, by Kouandété. Presidential elections are held in 1970 but are abandoned. Power is ceded to a presidential council which consists of Ahomadegbe, Apithy, and Hubert Maga (the former first president who now returns from exile). Maga had received almost equal support in the abandoned poll, and it is he who is the first of the three to serve as president with a two-year term. The country has experienced almost continuous strife following independence, overseen by a semi-democratic government which has seen frequent changes in ruler, mostly at the hands of the military. In 1972 yet another military coup, this time led by Mathieu Kérékou, overthrows the ruling council and establishes a Marxist government. The council members (including Maga) are imprisoned until 1981. Dictator. Stood down after free elections. Died 2015. Shortly after adopting a Marxist-Leninist form of government for the state, Kérékou renames the country the People's Republic of Benin. In the same year the Marxist People's Revolutionary Party is made the country's sole political party. Kérékou's Marxist military council is dissolved and elections take place, albeit with Kérékou as the only candidate allowed. 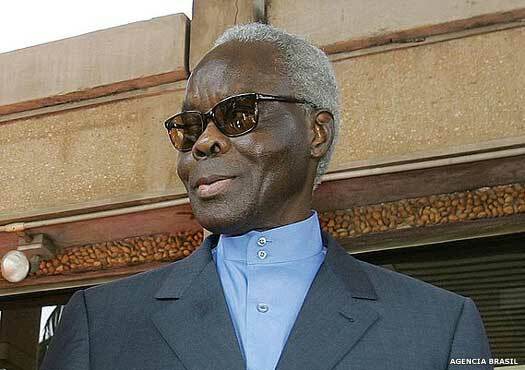 In 1980 he is confirmed as the elected president by the Revolutionary National Assembly. The country has undergone an economic crisis in a decade which forces Kérékou to abandon Marxism in favour of a parliamentary system. The following year the country's name is changed on 1 March to the Republic of Benin (dropping the Marxist 'People's' prefix from the title), and Kérékou is largely stripped of power by the National Conference. Kérékou loses free elections to Nicéphore Soglo (cousin of Christophe Soglo), and he steps down. He later stands for the 1996 elections, which he wins, and governs fairly, without attempting to change the new 1990 constitution to allow him to remain in power. Fully free and fair multi-party elections in the country draw international praise. Political newcomer Yayi Boni, running as an independent, wins the run-off vote in presidential elections. The incumbent since 2001, the re-elected Mathieu Kérékou, is barred from the poll under a constitutional age limit. In the following month, April, the World Bank and the African Development Bank approve debt relief for several countries, including Benin.